Time flies when you're having fun? It flies much quicker when you're having rum! Set in a cool rustic form, a skeletal pirate is pictured at the centre of this tin sign, gladly downing a bottle of rum as it flows straight through him! 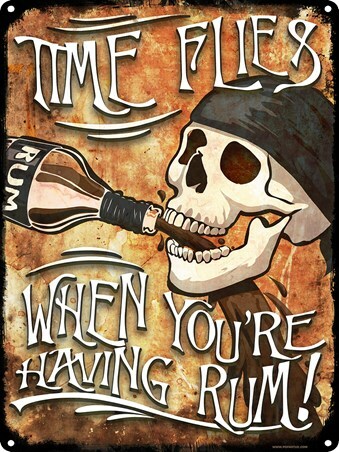 With the brilliant caption, 'Time flies when you're having rum' displayed in bold lettering along the top and bottom, this will definitely make a hilarious impact once hung in your home and will soon have you reaching for the nearest glass of rum. 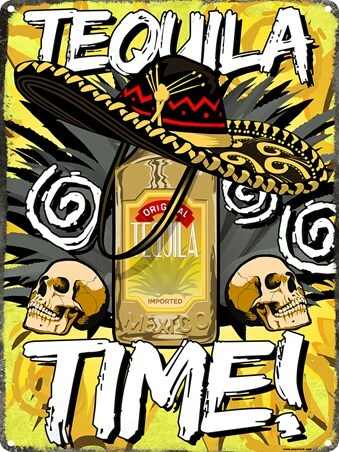 High quality, framed Grab A Bottle!, Time Flies When You're Having Rum Tin Sign tin sign with a bespoke frame by our custom framing service.